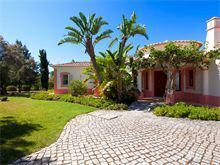 Casa Brasil is situated on the prestigious Clube Carvoeiro development and enjoys a privileged position in substantial landscaped gardens close to the Tennis Club. 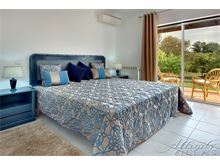 This modern and spacious, bungalow style, villa is very tastefully decorated with good quality furnishings throughout. 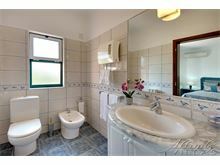 All bedrooms have air conditioning and en suite bathrooms. The beautiful garden has large lawns, covered and open terraces, brick built barbecue, pretty flowers and mature trees and palms, offering both privacy and the perfect place to relax. 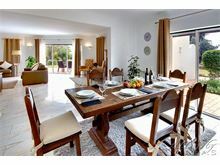 With the added bonus of the good sized pool being heatable, Casa Brasil is ideal for holidays at any time of the year. The local Tennis Club offers weekly membership or pay and play with a selection of court surfaces, gym, restaurant, snack bar, hair salon, communal pool, mini golf, aerobics classes, it has something to offer all the family. Carvoeiro centre is just a short drive away. 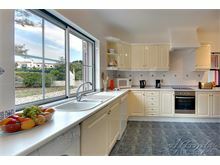 Approximately 2.5 kms from the village centre, beach and shops. Entrance into cool marble hall, modern kitchen with dishwasher, washing machine and microwave, sitting room with log burning stove, TV, DVD and stereo, dining area, 1 twin bedroom (twin mattresses on double base) and shower room en suite and doors to the garden, 1 double bedroom and shower room en suite and doors to a terrace, 1 twin bedroom (twin mattresses on a double base) and full bathroom en suite. Maid service 3 times per week. 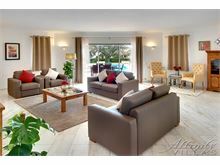 Air conditioning, pool heating and WiFi are available at extra cost, if required. Casa Brasil was a delightful villa. Although we thought it might be a little too far walking distance from Carvoeiro town we did not find this too difficult, four people aged 26-61. Local management excellent. 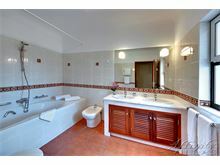 Lovely villa ,well equipped, nice pool. This villa is in a good location and the gardens were more like a park. It was very peaceful and although there were other villas nearby, we felt very secluded. 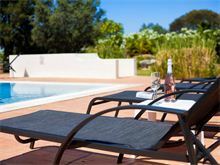 The villa was in an immaculate condition, was very well equipped and very comfortable. 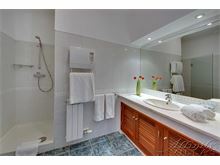 All the staff were excellent, the maid was very efficient and discreet. House manager was on hand for any queries. 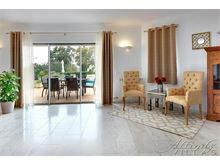 We have had many holiday villas in the Algarve and we would rate Casa Brasil as one of the best. It was our first visit to Carvoeiro which we loved and hopefully will return. 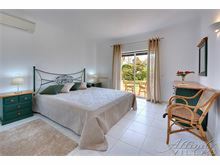 This villa is on a beautiful plot in a great location. I actually don’t want to recommend it for fear of it becoming so popular we can’t book it in the future! This villa is beautiful in every sense of the word. The outside area and swimming pool is outstanding! The maid and house manager wonderful. Had an amazing 2 week stay and would not hesitate to stay again or recommend to others. My 6th visit to the Algarve and the best due to the quality of the villa. Excellent house manager - we are fussy clean people and it is rare that something meets our standard. Casa Brasil did and we shall be booking again for 2014. A lovely villa, fantastic garden, wonderful pool. The villa was amazing great location.swimming pool was awesome. 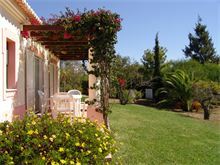 Great Villa with lovely gardens in a perfect spot . Close to Tennis Club and short walk to shop for fresh bread etc. First time in 15 years we'll go back to the Villa next year! We had a wonderful two weeks staying at Casa Brasil. Heavenly grounds, incredible pool, villa that felt like home - all set in the perfect location. The property sat in large grounds with other properties a good distance away. The pool which we had heated was fantastic and our children played for hours in the lovely warm water. The Villa was well kept, clean and had everything we needed, with lots of space for us all to enjoy. We will be booking again for next year! I usually book a different villa every year but for Casa Brasil I would make the exception and book again! The grounds of the villa are excellent, colourful and create a lovely view no matter from which direction. 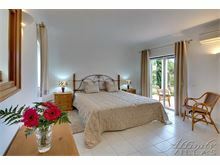 Peaceful but close to all the amenities you need. 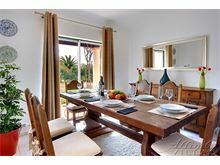 Spotless villa real friendly welcome, well appointed kitchen, a really nice relaxing peaceful villa to stay just the tonic for re charging the batteries. Would love to come back. Beautifully kept villa, pool and garden. Staff were friendly, efficient and discrete. The family had a wonderfully relaxing break. Wonderful holiday. Everyone we met at Affinity Villas from the house manager to the maid, gardeners and pool team were fantastic. Villa is excellent. 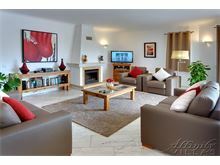 Would definitely recommend to anyone wanting a home for a special family holiday.